Do you suffer from a draft that comes in under your door? Solve the problem with a drop seal! A drop seal is mounted at the bottom of the door and avoids unpleasant draft from blowing in. Besides protection against drafts, some drop seals protect against noise and fire as well. How does a drop seal work? A drop seal is located at the bottom of your inner or outer door. The system prevents draft, fire and/or noises automatically with the help of unique technology. This technique makes sure that the drop seal lowers down immediately after closing the door in its door frame. When the door is opened, the drop seal pulls up, and the door can move without problems. This way, you have the best possible draft protection for places you can’t protect with a draft strip. Built-in drop seals can hardly be seen on the door. A cutter is made in the middle of the lowest part of the door. The drop seal is placed inside this. When creating a cutter, please make sure that you know the precise size of the drop seal so that it fits in perfectly. It’s obviously not the intention to make the cutter way bigger than the drop seal itself. 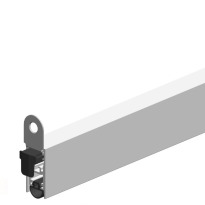 In the product information, you read about the maximum distance that the drop seal can bridge. By reading this information carefully, you can nose out if this variant solves your problems. Surface mounted drop seals are mounted on the front of the door. That way, a cutter isn’t necessary. Ellen drop seals are famous in the world of draft protection. Because of the far-reaching technology of Ellen Matic, you’re assured of a decent product with a qualitative mechanism. 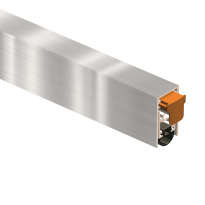 The Ellen drop seal is reasonably priced as well, which makes your choice for aluminium profiles even easier.